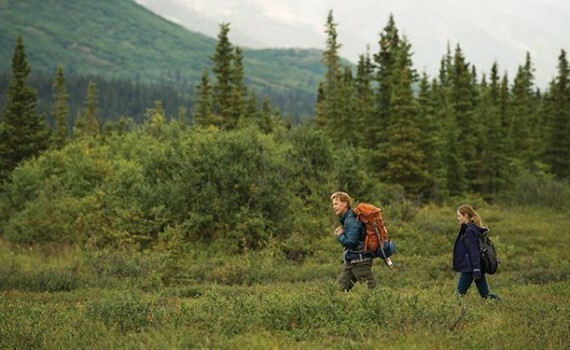 Wildlike is a recipe well-followed more than it is a strong film. Just look at the elements of the entirety and you can see exactly what was happening: an indie director, an established veteran, a new face, a stunning location, a heavy theme, a traumatic back story. It was designed to be successful more than it was excellently crafted, putting pieces together that have a high percentage of working and hoping that the cast was talented enough not to mess it up. In a word, it’s safe, not exciting, which isn’t exactly a cutting critique, but shouldn’t be seen as high praise either. Frank Hall Green is an amateur when it comes to feature-length films, so you can’t blame him for not producing something daring in what is basically his first attempt. But you also can’t get excited about a movie that’s solid rather than good, especially when the acting won’t exactly blow you away either. Mackenzie is 14, her mother has drug problems, her father has died, and her life isn’t exactly under control. And so her mother sends her from Seattle to Juneau to live with an uncle for a while, just until things settle down. But although he seems nice at first, his motives quickly become predatory, creating a world that Mackenzie can’t navigate. So she runs, without thought or motive, she runs to save herself from a man who will destroy her youth if she stays. But this is Alaska, you don’t just hitch a ride on the highway, and as Mackenzie makes her way towards Denali she becomes more unsure of how she’ll ever make it back home. Her luck turns when she meets Bartlett, a lonely hiker who doesn’t want company or responsibility, but just might need those very things to keep himself together, making Mackenzie his savior just as he is hers. It’s all just a bit too much of a set up, a story designed too neatly to be honest. The abuse, the runaway, meeting a good man, the trek across the beautiful Alaskan wilderness, finding yourself along the way; smart perhaps, but not believable enough, not creative enough, and perhaps a touch too clean. Casting Bruce Greenwood, a solid but not extremely famous actor, that was an intelligent choice. And putting him alongside a young actress, letting her make her mark in this film, that was also smart. But it didn’t totally work for two reasons: 1) the project was unoriginal/unimpressive, and 2) Ella Purnell was pretty bad. Had she blown me away, perhaps I could have forgiven the standard plot lines and typical emotions. But alongside Greenwood, who might not be phenomenal but isn’t a schlub either, her lack of natural acting talent was exposed. She has the face for it, a general look about her that is captivating, but her dialogue was off, it never felt real, and the film suffered when she spoke. Otherwise, in the moments in the woods, there was a peace and a feel that I liked, there was catharsis by the end. But the story was a tad too recycled and Purnell’s acting wasn’t quite up to par, making Wildlike fine without allowing it to be fantastic.